USES: Paroxetine is used to treat depression, panic attacks, anxiety disorders, and a severe form of premenstrual syndrome (premenstrual dysphoric disorder). It works by helping to restore the balance of a certain natural substance (serotonin) in the brain. 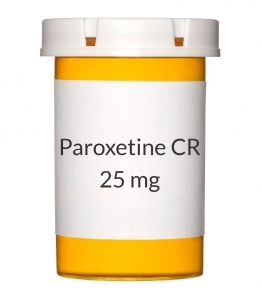 Paroxetine is known as a selective serotonin reuptake inhibitor (SSRI). This medication may improve your mood, sleep, appetite, and energy level and may help restore your interest in daily living. It may decrease fear, anxiety, unwanted thoughts, and the number of panic attacks. Paroxetine may lessen premenstrual symptoms such as irritability, increased appetite, and depression. OTHER USES: This section contains uses of this drug that are not listed in the approved professional labeling for the drug but that may be prescribed by your health care professional. Use this drug for a condition that is listed in this section only if it has been so prescribed by your health care professional. This medication may also be used to treat other mental/mood disorders (such as obsessive-compulsive disorder-OCD, post-traumatic stress disorder). HOW TO USE: Read the Medication Guide and, if available, the Patient Information Leaflet provided by your pharmacist before you start taking paroxetine and each time you get a refill. If you have any questions, ask your doctor or pharmacist. Take this medication by mouth with or without food as directed by your doctor, usually once daily in the morning. Taking this medication with food may decrease nausea. If this medication makes you sleepy during the day, talk to your doctor about taking it in the evening. Do not crush or chew this medication. Doing so can release all of the drug at once, increasing the risk of side effects. Also, do not split the tablets unless they have a score line and your doctor or pharmacist tells you to do so. Swallow the whole or split tablet without crushing or chewing. The dosage is based on your medical condition, response to treatment, age, and other medications you may be taking. Be sure to tell your doctor and pharmacist about all the products you use (including prescription drugs, nonprescription drugs, and herbal products). To reduce your risk of side effects, your doctor may start you at a low dose and gradually increase your dose. Follow your doctor's instructions carefully. Do not increase your dose or use this drug more often or for longer than prescribed. Your condition will not improve any faster, and your risk of side effects will increase. Take this medication regularly to get the most benefit from it. To help you remember, take it at the same time each day. If you are taking paroxetine for premenstrual problems, your doctor may direct you to take it every day of the month or just for the 2 weeks before your period through the first full day of your period. It is important to continue taking this medication even if you feel well. Do not stop taking this medication without consulting your doctor. Some conditions may become worse when this drug is suddenly stopped. Also, you may experience symptoms such as mood swings, headache, tiredness, sleep changes, and brief feelings similar to electric shock. To prevent these symptoms while you are stopping treatment with this drug, your doctor may reduce your dose gradually. Consult your doctor or pharmacist for more details. Report any new or worsening symptoms immediately. It may take up to several weeks before you get the full benefit of this drug. Tell your doctor if your condition does not improve or if it worsens.